Falls—whether on the same level or from a height—are leading causes of workplace injuries, disabilities, and deaths in the United States. In fact, according to the Bureau of Labor Statistics (BLS), on-the-job slips, trips, and falls resulted in 227,760 injuries and 887 fatalities in 2017 alone. and spinal cord damage resulting in varying degrees of paralysis. On-the-job falls frequently leave victims facing challenges with physical recovery, substantial medical bills, and significant time away from work. 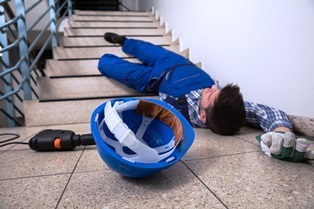 So it's essential to know that if you suffered a workplace fall injury, you may be entitled to receive workers' compensation benefits such as coverage for medical expenses, reimbursement of lost wages, and temporary disability payments. Do you have questions about your rights and options after sustaining a Georgia workplace injury? The skilled attorneys with Van Sant Law are here to help you get the benefits you deserve. Contact us today to schedule an appointment for a free initial consultation to discuss your case with an experienced member of our legal team.